While my oldest daughter was in college in Memphis, TN we had the opportunity to visit the Great Smokey Mountain National Park. Our visits were brief but we tried to find an interesting hike to break up the trip back to CT. Our first adventure took us to Gatlinburg, TN and a short hike to Laurel Falls. It was a chilly morning and we saw lots of deer close up along the trail before we reached the falls. This was my first experience in the southern Appalachians and I was impressed with the ruggedness of the terrain. When it was time for her to graduate, I needed to drive an extra vehicle down to pick up her things so I took a few days and camped along the way down. 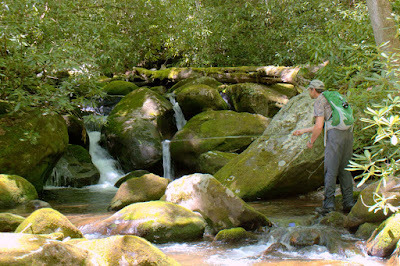 The highlights of that particular trip was seeing her graduate at the top of her class and spending a day chasing brook trout with David Knapp of The Trout Zone on some small streams in the Smokies. We had a fantastic day together and a new friendship was formed. Some day I hope to get there again! Stunning pictures, Mark. Congratulations to your daughter and your entire family for your daughter graduating at the top of her class. Much to be proud about with that accomplishment. Those are some gorgeous waters Mark. A gift on all fronts - your daughters hard work celebrated, making a new friend, and spending time in one of Natures many Chapels... Awesome! Will - thanks! If you ever get a chance to visit Southern Appalachia I think you would really enjoy it! 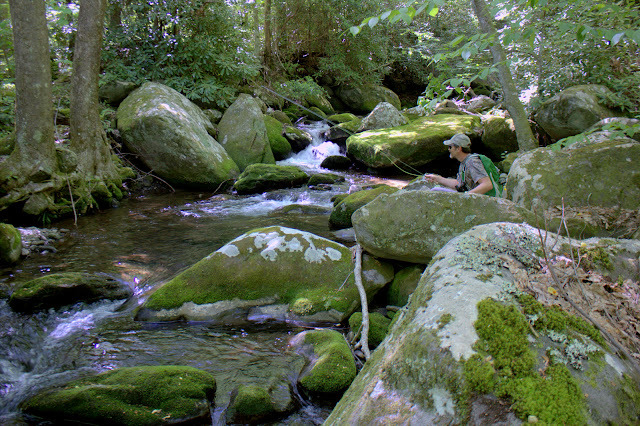 The Smokies are breath-taking, we try to make a trip every year. Strange as it sounds I don't get to fish. I'm always with family who want to do other things. If you get back be sure to go to Clingmans Donme, it is the highest mountain in the park reaching 6643 ft. We were there one morning a few years agos and saw something I will never forget; we were standing above the cloud cover looking down, which was unbelievable. Bill - I am thankful I had the chance to spend some time in the GSMNP and meet David. He is a great guy and we thoroughly enjoyed our day together! I wanted to hike up Clingman's but we just didn't have the time. I will have to save that one for another trip down that way.